Guylain Gustave Moke Blog: IRAN: Election or Camouflage? Ex Iranian President Mahmoud Ahmadinejad has registered as candidtae in May election, despite the warning of Iran's Supreme leader Ayatollah Ali Khamenei. The registration for the May 19 election started on Monday and will last five days, after which entrants will be screened for their political and Islamic qualifications by a vetting body, the Guardian Council. Elections in Iran are not democratic and fair. The run-up is marked by haggling and the post-election period by maneuvering. Only those who unconditionally support the "Wilayat al Faqih" or Guardianship of the Jurist, are permitted to run for president. The office of the Wilayat al Faqih was created for Ayatollah Khomenei, who drove out the Shah, and after Khomenei's death in 1989, Khamenei became the new supreme leader. He is the arbiter of war and peace, which means that he can issue the order to build a nuclear weapon or to reconcile with the "Great Satan" the United States. 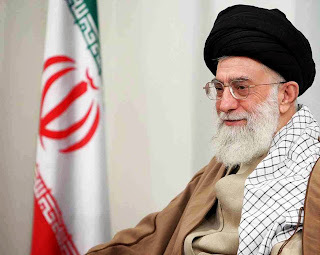 Khamenei is essentially the country's supreme leader for life, and his decisions are considered irrevocable. Because of this absolute power, he is no different than the autocrats the revolutionaries once vowed to defeat. On May 19, the leadership in Tehran will deceive the Iranian people. It won't be the regime's first lie, but it is characteristic of the most recent history of the Islamic Republic.The propaganda machine of Supreme Leader Ayatollah Ali Khamenei, 78, is leading them to believe that they can indeed shape their country's future. If they weren't as afraid of the regime, many Iranians would not only laugh out loud at his audacity, but would also go to the barricades against this phony democracy. But in the last years, Iran has become a republic of fear. The prisons are filled with countless activists and dissenters, and some of them may be there because they laughed too loudly at Khamenei at some point. Sometimes it doesn't take much to be arrested, interrogated and locked away. But the fear is mutual. While the people tremble at the thought of being apprehended by the regime's henchmen, the leadership is also nervous about new demands for more freedom and democracy. In past elections, Khamenei made the mistake, disastrous from his standpoint, of allowing candidates to run who aroused hopes of liberalization. After three decades of being ruled by the turban-wearing ayatollahs, merely the prospect of a small measure of freedom was enough to drive millions to the polls and then into the streets, when they believed that their "green movement" had been cheated of its rightful victory. This time Khamenei is expected to deliberately obstruct a large number of potential candidates who will show only the slightest potential of wanting to question the pure doctrine of the Islamic Republic that the revolutionary leader fiercely defends. The ayatollah is so fearful that he doesn't even permit the candidacy of former President Mahmoud Ahmadinejab. As a result, the political stage is now filled with a group of especially lackluster apparatchiks. Officially, the constitution does provide for democratic corrective action, a right that many Iranians desperately invoked in the past, constantly pinning their hopes on the next election, the next parliament or the next president. Eventually they also came to believe that Khamenei, who considers himself a man of the people, could not completely ignore their desire for change. But Khamenei clings tightly to his power and is not interested in the sort of change that has taken hold in many neighboring countries. In the 29th year of his rule, he views any change as a threat. Surrounded by enemies within his own ranks, the ayatollah sees an abyss running alongside the path of the revolution. The reformers are no longer likely to pose a threat. Although two candidates are considered part of the reform wing, it is questionable whether they will be able to mobilize large numbers of voters. The leader of the green movement is under house arrest, while other dissenters have fled the country or have simply given up. A greater threat to Khamenei comes from the nationalist wing. For populist Ahmadinejad, nationalism is more important than Islamism. In the populist form of Islam that he preaches, the position of the once untouchable Khamenei is reduced to that of representative of a useless caste of clerics. At first glance, Khamenei now seems stronger than before. The reformers are intimidated, the nationalists, populists have been thwarted, and even the pragmatists have been weakened. Manipulation and lies are part of the business of politics everywhere. But a system that allows no dissenting views is commonly known as a dictatorship, and an election that isn't one is called camouflage.